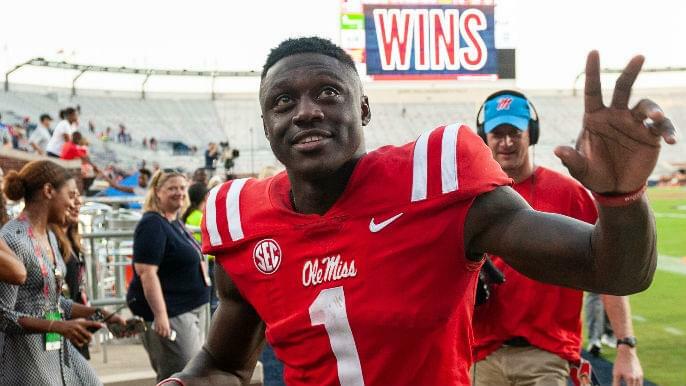 Ole Miss receiver AJ Brown has enjoyed quite the visit to the Bay Area. On Monday, Brown met with the 49ers as one of the team’s 30 pre-draft visits. The following morning, he ran “the hills” with Jerry Rice, who helped popularize the workout, and posted a photo via Twitter locking hands with the 49ers legend. Brown is one of the top receivers in the 2019 NFL Draft, set to begin next Thursday, Apr. 25. The only question is whether he will be available when the 49ers select their second pick at No. 36 overall. From a numbers perspective, Brown was among the best receivers in college football in each of his final two seasons at Ole Miss. He caught 75 passes for 1,252 yards and 11 touchdowns in his sophomore year. He was better his junior year, amassing 85 catches, 1320 yards (a school record), and six touchdowns. He posted solid scores across the board during his Combine workout, running a 4.49 40-yard dash and lifting 19 bench reps.
During his Combine interview with the media, Brown said he is the best receiver in the draft. The 49ers seem to be seriously considering taking a receiver at No. 36 overall. Six of their 19 reported meetings have been used on receivers, including Brown, Hakeem Butler, N’Keal Harry, Deebo Samuel, Jalen Hurd, and Preston Williams.